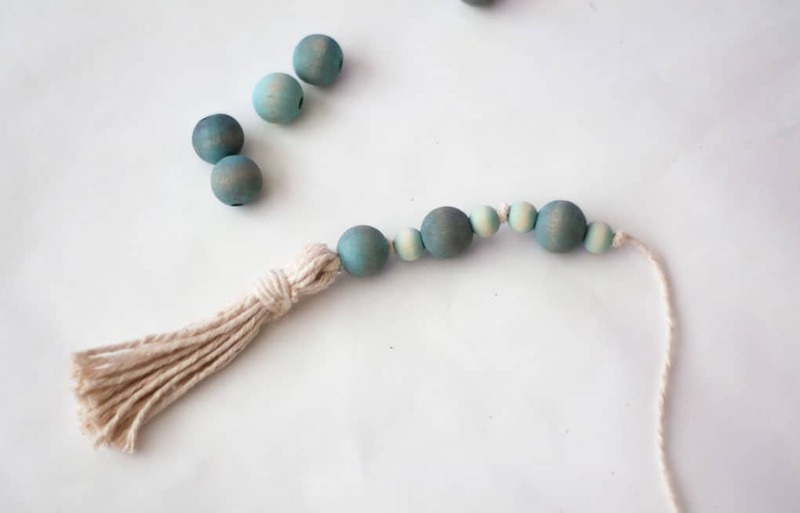 Wood Bead Garlands are strung all over the place (hehehe) in cute little boutiques, home stores, and Etsy! 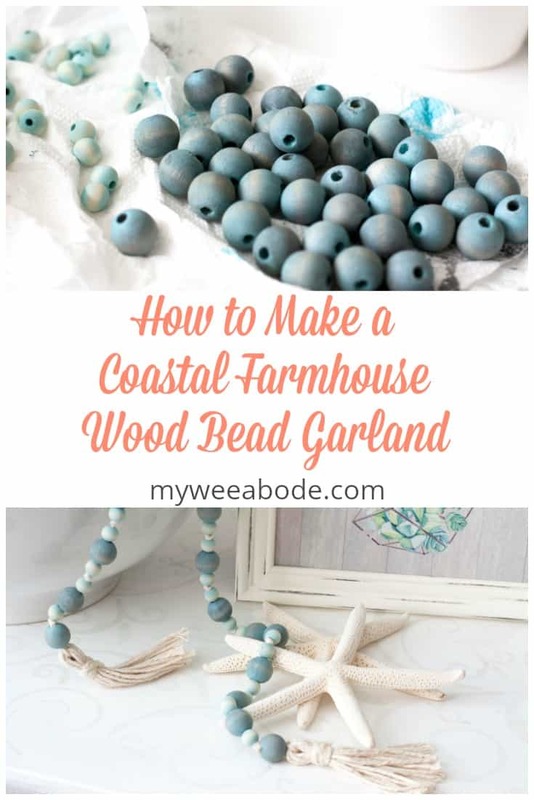 Today, I’m going to show you how to make a coastal farmhouse wood bead garland for a fraction of the cost! 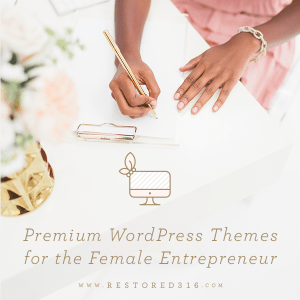 It’s early morning where I sit writing this post… 5:30am to be exact. I’m trying to up-my-game by going to bed a bit earlier and waking up earlier, as well. What about you…Are you a morning person or night owl? 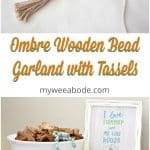 Well, this morning I’m up early so I can share with you how I created this farmhouse wood bead garland… with a twist! I went a bit coastal, too, and even gave the beads an ombre twist! If you want to check out another easy and affordable farmhouse DIY, check out how I made this Farmhouse Cake Plate from dollar store items! 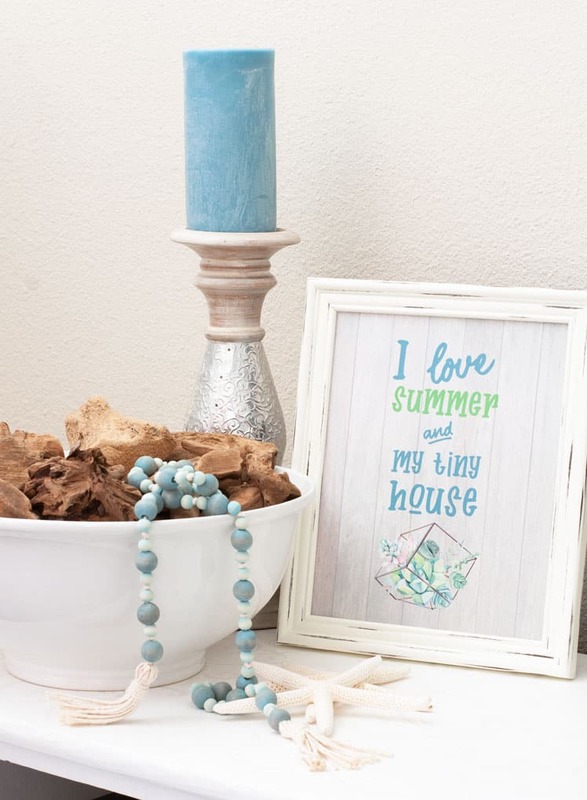 Have you seen these garlands all over the home décor stores, cute little boutiques, AND Etsy? I have… Anywhere from $15-$50!!! I’ll tell ya, this girl ain’t gonna pay $15 for a string of wood, let alone $50! I knew I could find the beads for a lot less, AND add my own style, so off to Pinterest (then Amazon) I went! This post may contain affiliate links, at no additional cost to you. For more information, see my complete disclosure HERE. 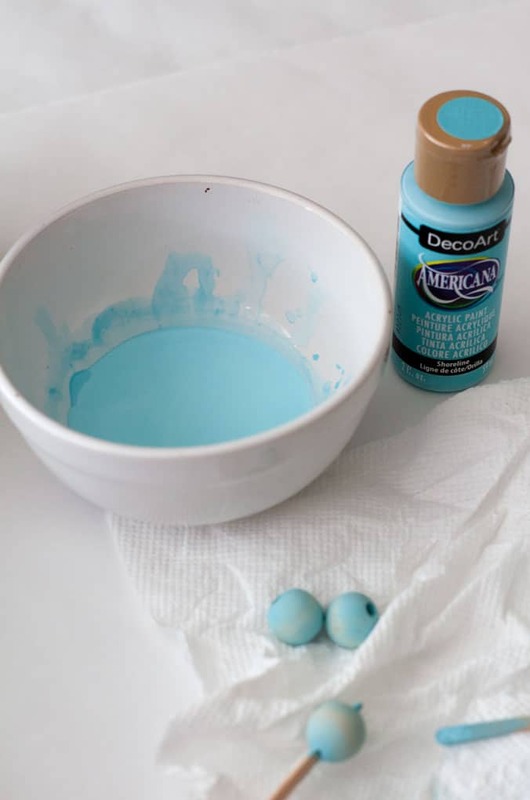 The first thing to do is mix the DecoArt Americana acrylic paint with a bit of water in a small bowl. 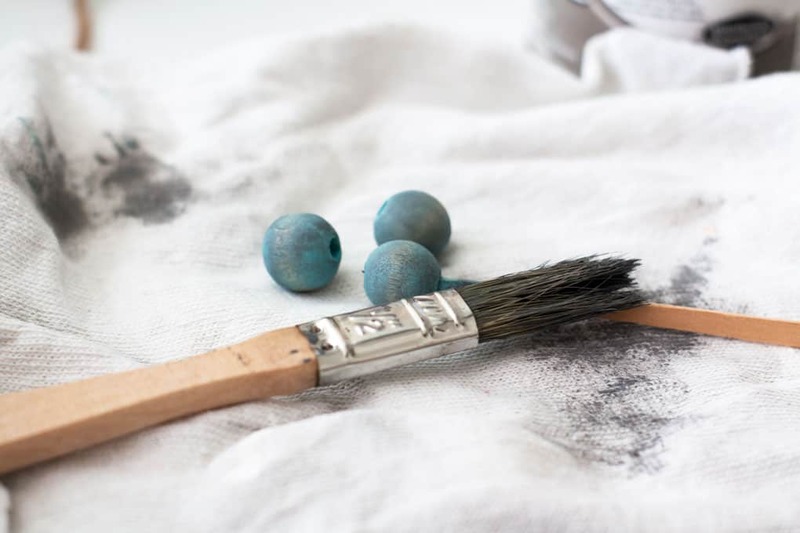 Watering-down the paint will give the washed-ombre look! I used a small fruit bowl and added about a tablespoon of paint with about 2 teaspoons of water then stirred it around with a small mixing stick. I then placed one of the lint free cloths near the bowl. Quick and messy… I’m all for that! DecoArt Americana acrylic paint was SUPER easy to work with, and I loved the results! 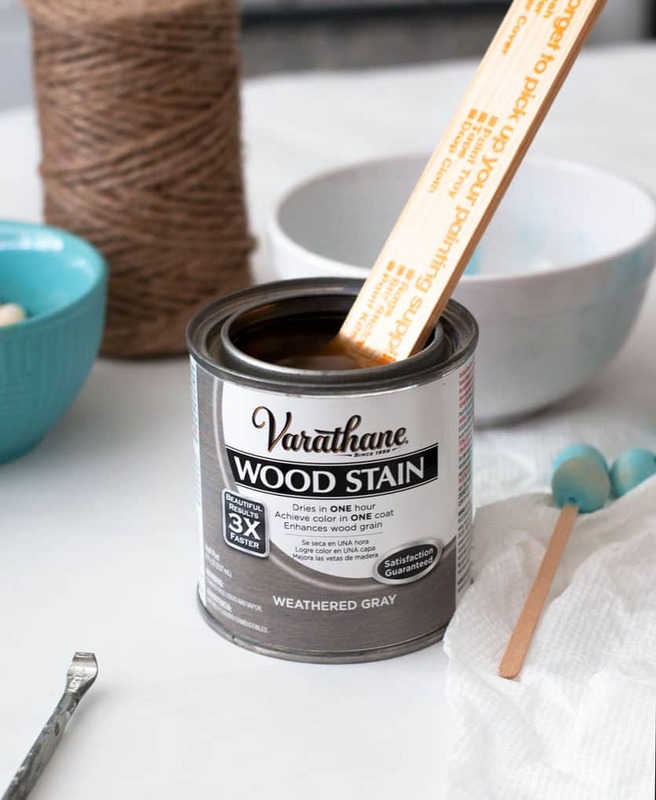 Using your large mixing stick (I used a normal paint stick), slowly mix the Varathane stain in the can (you don’t want any splashing going on). Also, if you try to shake the can to mix the stain, some of the pigment may remain at the bottom, so using a stir stick is kinda important. When the large beads are dry from the acrylic ‘wash’ paint, take a small stick (my mixing sticks worked great for this, but a wooden skewer, etc. would work just as well) and put it through the bead. Then, using the chip brush, paint the bead with the Varathane stain (it doesn’t have to *completely* cover), and, again, quickly wipe it off with a clean lint free cloth. (I wiped it off this time, as opposed to rolling it around… it took off more of the stain and left more of the ombre effect). 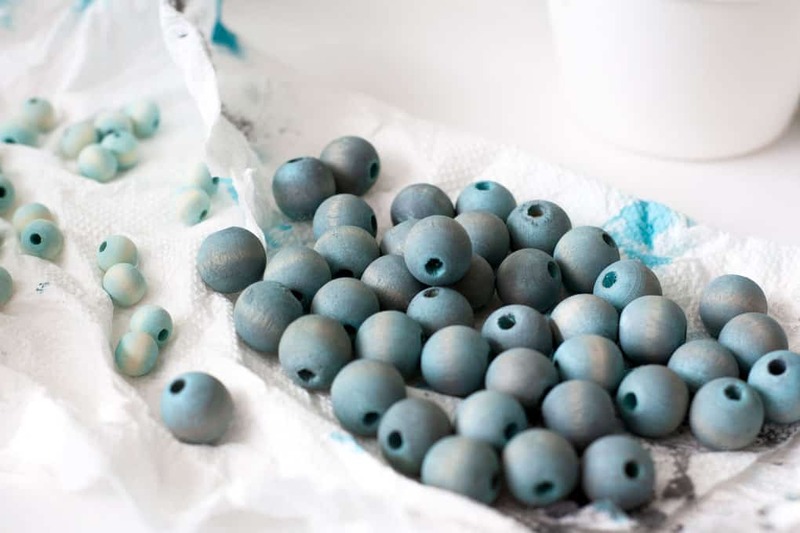 I did the staining on these beads one-at-a-time because I wanted to make sure I could wipe most of the stain off (this quick-dry Varathane stain dries 3x faster than your average stain). I think it would have been more difficult to achieve the look I wanted had I used the same process as the acrylic paint. I thought using cotton twine would give the garland a bit more of a coastal farmhouse look, but you can use jute, or any other type of twine that might make you smile! Hehe! 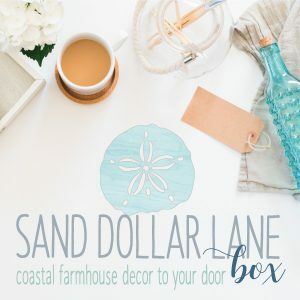 If you want to see more of my coastal farmhouse ‘feel’… take a look at the Spring Tour Part 1 and Part II of My Wee Abode. Take the twine and wrap it around your palm about 10-15 times, then remove it from your hand and cut it from the spool. Set aside. 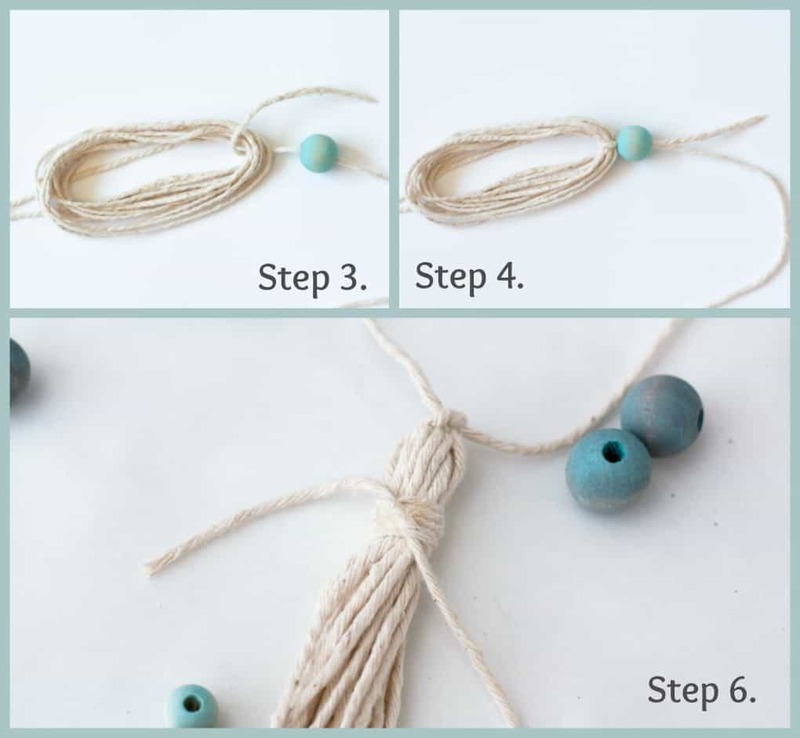 Take your bead string and thread one large bead onto the twine. Add a tiny bit of hot glue at the other end of the bead, pull the small strand snugly through and clip off. Now, cut through the bottom end of the bundle to make the tassely part (yes, I think a made a new word… tassely). Trim to the size you desire. Ta da! A tassel! Hint: I took a skewer (for lack of a better word), and turned it through each bead before I started threading them. This made it easier to get the twine through. Tie your first knot at the base of the large bead. Then string a small, large, small bead on the string, and knot again. 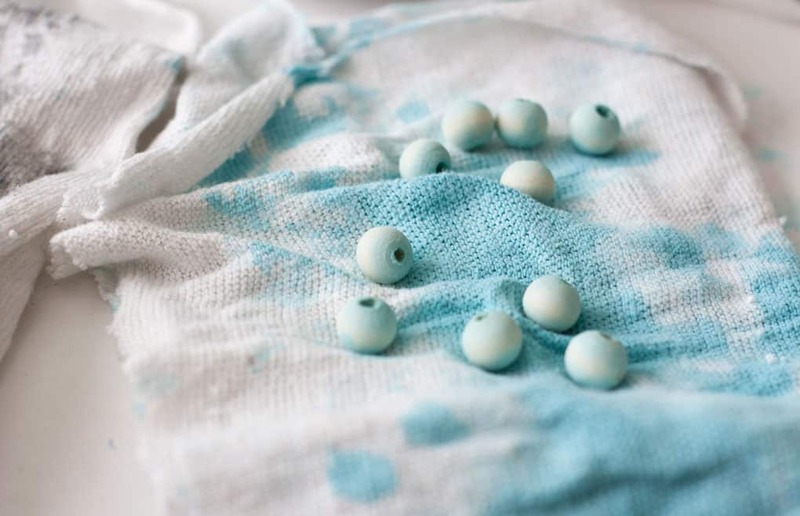 Repeat for the length of your garland, leaving a large bead at the end of the strand. Create another tassel for the end using the same steps in the tassel instructions above. I actually love this vignette sitting on my media console. Picked up about 6 starfish at HomeGoods… not one broken piece on them! Woot! 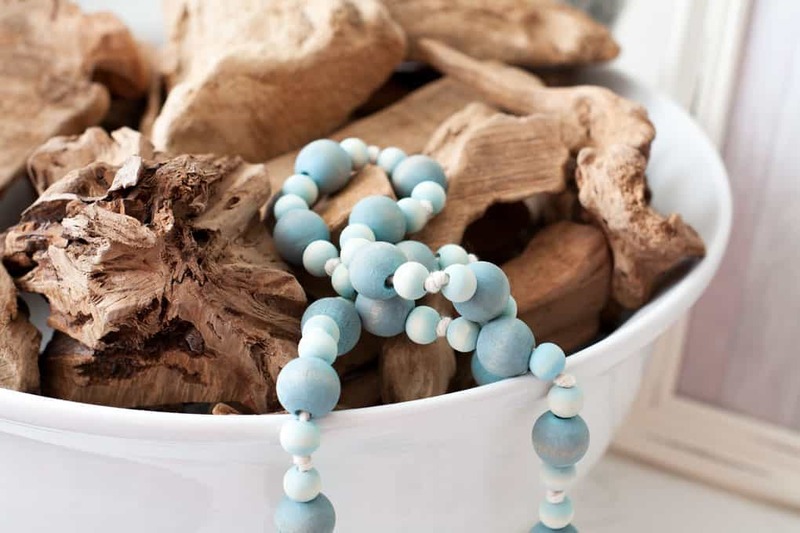 Love me some driftwood, too! Wanna know where you can get this printable???? You can get this printable, and all my seasonal printables in my free Printables Library. Simply subscribe to My Wee Abode, and get the password delivered straight to your inbox, along with all the other fun offered through the blog! So… this garland cost approximately $5-10, I got exactly what I wanted, and I have supplies leftover for another project or five! Not bad, huh? 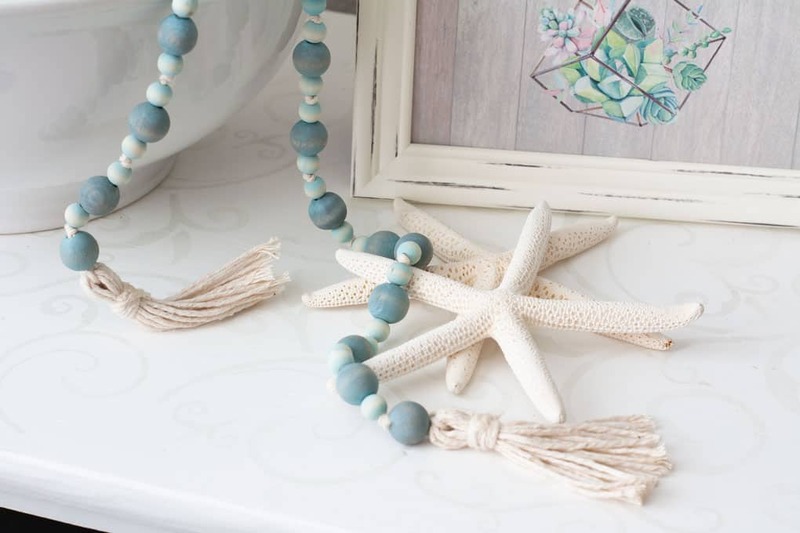 Hope you enjoyed learning how to make a coastal farmhouse wood bead garland! What would you do to add your own flair to this diy project? Makes me wanna paint! =D Cute idea! LOL!!! Thanks! You’ll have lots of opportunities in your new place! Love ya, Boo! Julie, I love these coastal beads. Your step by step tutorial is easy to follow. They look so pretty with the cotton. Have a wonderful week! Thanks so much, Pam! As you know, kind and encouraging words are always welcome! Hope you have a great week, too! Hugs! So pretty. My favorite picture is the beads on the blue jar. Thank you! I was really torn between the two styles. 🙂 But, I’m glad you liked the jar… it’s a fave item of mine! 😉 Love ya! OMG, I love everything about this! The two colors and the contrast with he jute twine is spectacular. I also really love your print! I need to go home and print it off when I get home 🙂 The bowl full of driftwood is a nice touch too! I just love coastal decor. Thank you, dearheart! Love ya, and hope you are having a blast in Germany! Julie, I love this garland! 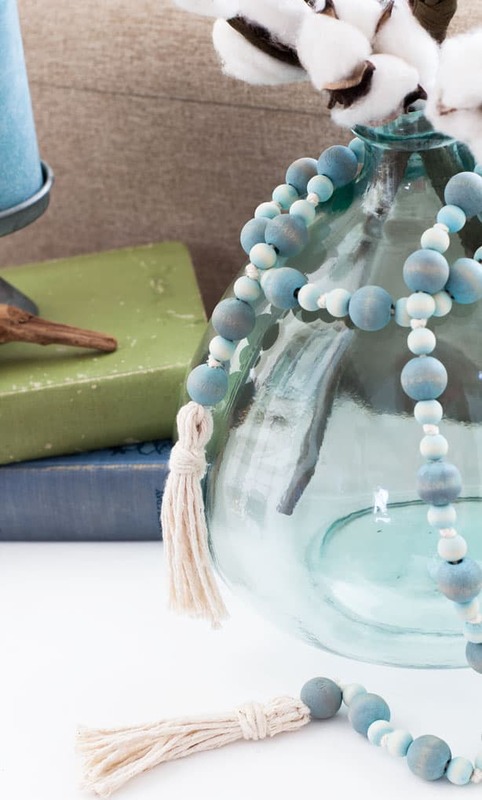 I bet you could make one of those cute tassel necklaces too. I see a trip to Michael’s in my future! Oh, I want to see it when you’re done, Stacey! Thanks for coming by! Hugs, sweet friend! So pretty, and would look perfect in my house, too! Thanks for the DIY, I might have to add this to my list of “to do’s”! Julie, I made a bead garland last fall and loved it, but I didn’t paint or stain it. 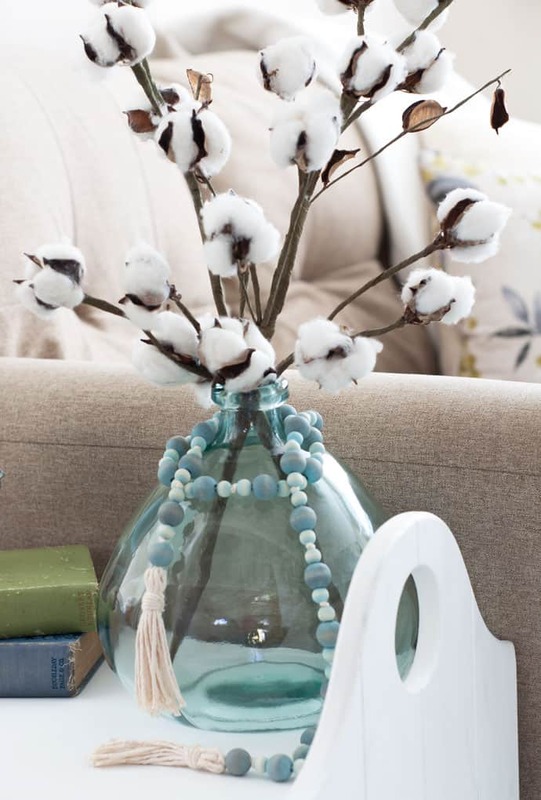 I love this approach and since my colors are coastal, I definitely be making this. Thanks for sharing the project. Great tutorial! 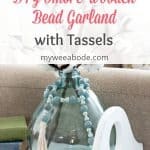 Now I know how to make a bead garland. Maybe I’ll make one in fall colors. Pinned! 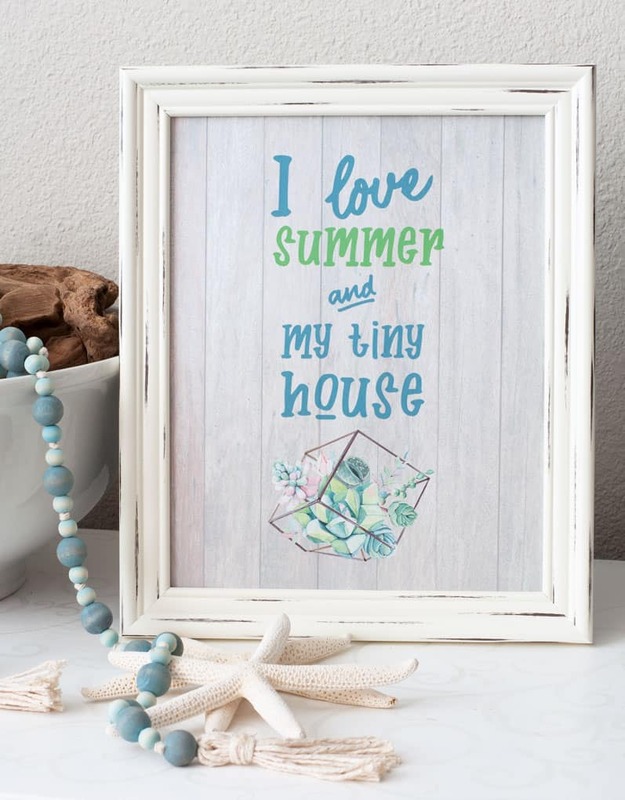 This is such a cute DIY project, Julie! So practical for saving money too, it’s crazy how expensive those wood bead garlands can get when you buy them from a store! Yes… I was REALLY surprised at how expensive they can be! 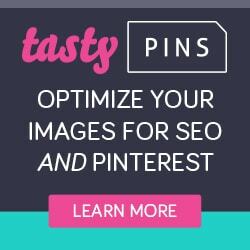 Thanks for the sweet words, Tiffany… I just saw this after saving some of your pins to my boards! 😉 Love your style! Oh how pretty! I love the colors, and the coastal theme is always a favorite of mine! Thank you so much for sharing at Thursday Favorite Things! Thanks, Pam! They were very fun to make… and actually fun to photograph! 😉 Always enjoy TFT! Have a wonderful weekend! These are gorgeous. I can just imagine all the different possibilities. I really love the way you worked with the paint to give the beads a watercolor feels. So pretty. Hmmm Now, I’m wondering what I can make with this technique. Inspiring! Hehe!!! Yep… all kinds of ‘washing’ we can do with wood! ;- Thanks, Patti! Julie those beads turned out so pretty! I love the colors you chose. I will be featuring this project today at The Creative Circle Link Party! I hope you stop by and share with us again! Thank you SO much, Linda! I did stop by, linked, and left a comment! 😉 You made my day, Linda! Congratulations on the feature on Thursday Favorite Things. I love blue and all things coastal so I really loved your post. Thank you so much, Amy, and I’m so glad you enjoyed the post! Take a look at the newest ‘coastal’ post I just published! 😉 Let me know what you think! Have a great weekend! 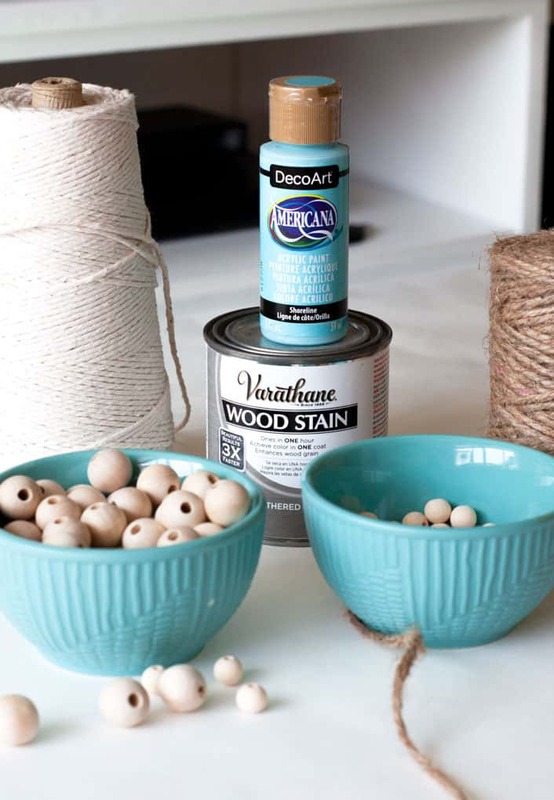 Thanks for the clear steps on making a wood bead garland. I think I’m going to make one with a tropical feel to it. Pinned. Thanks for coming by, Erlene! I would LOVE to see how you put a tropical spin on it! Feel free to share on my FB page when you do! Thanks for pinning! Hugs and hearts!